Marni Fogelson has written for websites including Inhabitots, Domino, and Ecofabulous. 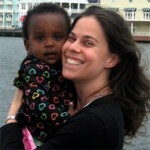 A mom of two based in Philadelphia, Marni is also a grant writer for several local non-profits and an active community volunteer. She has a B.A. in Romance Languages from the University of Pennsylvania and a M.A. in Photography and Disability Studies from NYU's The Gallatin School. When she's not taking her rescue hound for very long walks, doing yoga, or sneaking in a few pages of a novel, she can be found trying out new recipes for her very hungry family.